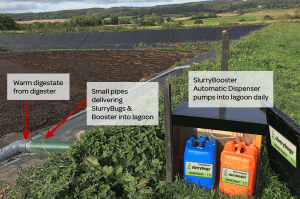 SlurryBugs treatment works best with little and often dosing, weekly at the very least. To make this as easy as possible, a simple automated system is available to dispense daily treatments from ready-to-use drums through a pre-set pump. To find out more visit www.envirosystems.co.uk or call 01772 860085.